Designed for Superior Flexibility and Accuracy. Engineered Quality. 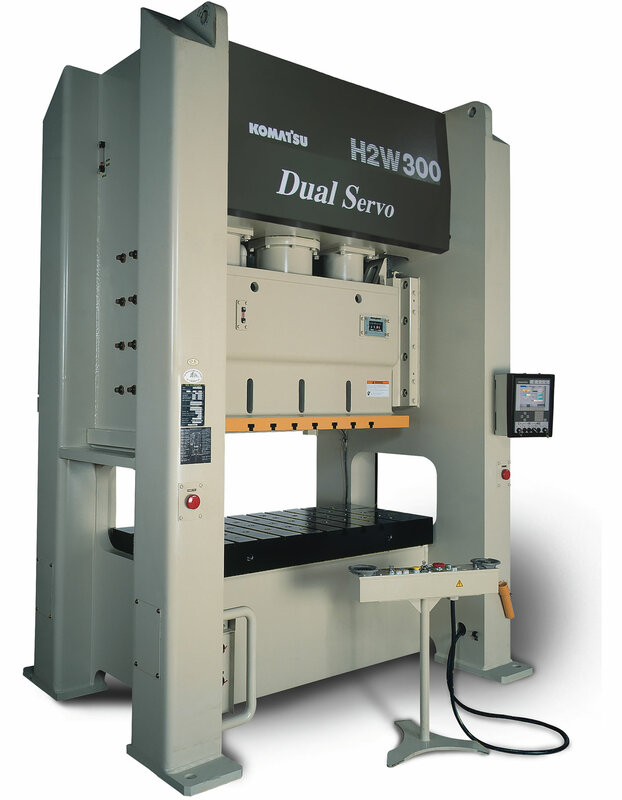 The H2W employs an extremely rigid balanced symmetrical design. Komatsu utilizes its welding and frame design technologies to engineer the one-piece welded frame, providing the rigidity of the larger tonnage straight sides at an affordable cost. H2W also offers a wide window for transfer and progressive applications. With all this, you get the Komatsu standard of uncompromising accuracy and high part consistency stroke after stroke. A Linear Glass Scale is mounted to the frame of the press and monitors the slide position to assure repeatable die height consistency at the bottom of the stroke where the work is being done. The linear scale is mounted to a sub-frame, fixed at the bottom to assure slide position accuracy and allowed to “float” at the top while the press frame is under load. With Auto Die Height Adjustment. The H2W series incorporates a dual servo drive system with independent control and monitoring of each connection point’s (right/left) actual position. The pess control monitors the slide position from both sides to assure consistent part quality. The independent right/left controls allow for slide tilt correction felt during eccentric loads. The H2W keeps slide tilt at a minimum during eccentric load conditions. Die height adjustments are automatically made during continuous operation of the press. System reliability is assured by constant position monitoring of the main shaft angle detector, motor encoder and actual slide position by the linear scale. Designed for high precision and less die wear. Thrust load from eccentric motion is absorbed by the plunger guide system. The plunger guide is the primary guiding force, preventing side load on the gibs. A size-specific plunger guide is engineered for each different press model, providing maximum performance for each unit. Komatsu also employs full-length gibs that capture the entire length of the slide guide. Gib tolerances are set to Komatsu’s tolerances of 0.0015″ nom. per gib with oil (not grease) lubrication, allowing them to last up to 200 times longer than conventional gibs. Together, the plunger guide and gib surface area add up to 4-5 times the guiding surface area of our nearest competitors. Less routine gib maintenance, less die wear and higher part accuracy are the positive end result, which can translate into improved profits for you. Komatsu’s unique combination of a high-torque gear box with a standard, high-efficiency AC servo motor allows for a compact and efficient drive system. The resulting symmetrical motion curve of the drive allows for increased productivity through the incorporation of a pendulum mode of operation. Dies requiring shorter stroke for operation can achieve increased productivity while maintaining the full benefits of the servo drive system. Helps prevent damage to the press and dies. All Komatsu presses are equipped with a hydraulic overload protector, a feature that has been standard for decades helping to protect against damage to the press. If the rated load is exceeded, the press stops automatically. Since the hydraulic pressure can be released easily, operations can be resumed smoothly even if jamming occurs. Advanced electronics technology provides user-friendly operation and outstanding reliability. The SIT IV electronic press control unit is designed to provide the fastest, easiest, and most reliable control available for all press functions. Included as standard equipment on the Komatsu H1F and H2W presses, SIT IV incorporates all the latest thinking in press control unit design. Simple Guidance. SIT IV displays operational procedure guidance for select press functions. Intuitive, user-friendly prompts guide press operators in a logical series of steps, for faster, more reliable press set up and operation. The SIT IV pendant is also used for all motion programming. Slide velocity is adjusted in percentage values. When a velocity change is desired, the exact position where this change occurs can be set by actual slide position or in degrees of operation. The slide motion can be programmed to mutliple stages before a complete return to Cycle Start Position (CPS) must occur. All information necessary for press set-up, start-up, operation and diagnostics is available in one display, at the touch of a button. Language terminology and graphics are user-friendly, easily understood by the press operator in plain view in one control central location on the digital display. Display also includes plain language description of fault messages. SIT IV has the ability to integrate with current press room equipment, such as electronic coil feeds. Operator “T-Stand” control interface houses all switches and push-buttons required for ordinary press set-up and operation, including Push Buttons for slide adjustment. Die Data Recording function can store and retrieve data, including cam and fault detection angle as well as production performance. Also includes digital display of “stored” press speed and actual press speed, plus crank angle. Alpha-numeric entry of die name and memo data for easy cataloging and referencing. Built-in Comm. Port for optional V.I.S. Extensive use of electronics gives outstanding reliability. Increased safety, longer operation life and high reliability. Digital display for improved operation performance. Digital display of the crank angle and electronic angle detectors provide increased accuracy for press operations. Automatic operation setting and die set-up functions are easier and faster for press operators, with precise, reliable settings every time. To protect the integrity of all electronic systems and provide additional safety, monitor lamps indicate defects in circuits of all electronic systems, and faults are detected instantly. Electronic Load Monitor (2-channel) – Load monitors are available to continuously monitor loads in all press operations, including blanking, bending, drawing, etc. The monitor also detects die overloads and underloads during operation. In addition, balanced die load is achieved by measuring the off-center-load, thus extending press and die life. Hydraulic die clamps available in either lever or cylinder type. Warning – For protection of the operator, point of use guards should be used at all times. Komatsu presses do not include O.S.H.A. recommended point of protection guards. Automation – Complete turn-key Komatsu designed press systems including coil lines, die carting and systems engineering tailored to your specific application. When a press is designed as a system, it should be expected to perform as a system without routine tear downs for wear items (the conventional “weak link” in our competitors’ presses.) That’s why every Komatsu Press comes with a Two Year Unconditional Warranty on anything that rolls, slides or moves – parts and labor. Unlike other manufacturers, there is no hourly limit – your press is guaranteed to perform 3 shifts a day, 7 days a week, 365 days a year. With Komatsu systems engineering it’s possible to extract the full potential from your press, and the full revenue potential from every job.